On the 2nd of May, 2018 the European Commission (EC) released its proposals related to the Multiannual Financial Framework (MFF) of 2021-2027. The Commission lays the ground for the long-term EU budget: amounts of funding dedicated to the different priorities, contributions, definition of different EU support programs and funding instruments. 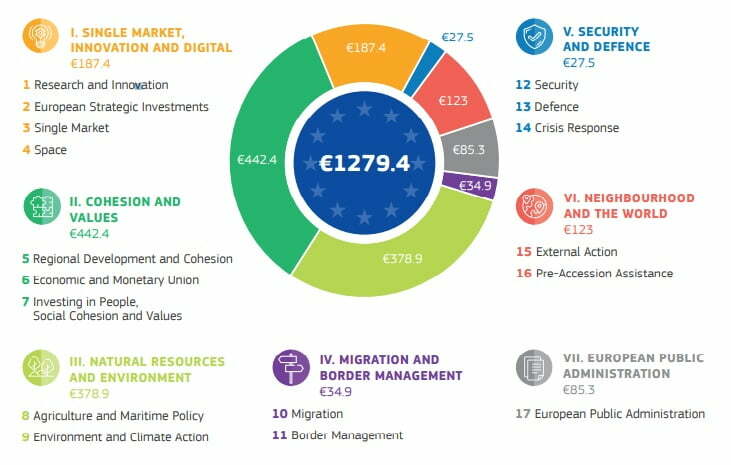 Overall the proposed budget amounts to €1.135 billion which equals to 1.11% of the EU27’s gross national income. A first difference compared to the current Multiannual Financial Frameworks, is that the new budget will be more flexibile. Indeed, a seven-years-budget can be a factor of stability and security for longterm projects. However, the Commission also proposed a reserve fund that can be used to react to unexpected events, such as financial crisis and new migrations, and quickly adapt to the needs of a rapidly changing society. Labeled as the ‘Modern budget for a Union that protects, empowers and defends’, the budget reflects all the EU’s political priorities indicated in the chart below, such as single market, security and migration. The new MFF will try to respond to societal challenges through a budget which, besides the typical revenues sources (customs duties, VAT and contributions from the Member States), also relies on new sources of income. In particular, this includes a tax system for multinationals, called the Common Consolidated Tax Base (CCTB), which should include also a 3% digital tax for tech corporations such as Google and Facebook. Such new tax would be collected by the European Commission directly instead of by the Member States. Another novelty is that the budget will take into account environmental issues. National contributions to the budget will include additional payments calculated on the basis of emissions trading systems by country and of amounts of non-recycled plastic packaging waste. In its proposals, the EC reminds that SMEs in Europe employ 93 million people and are the engine of our economy. InvestEU is a financial support instrument (e.g., loans, grants, equity) for businesses, especially, start-ups, small and medium-sized companies that are highly innovative and lack investment for their projects. In addition, the current SME program named COSME will remain in support of Single Market initiatives and will have a budget increase from the current 2.3 billion euros to 3 billion in 2021-2027. A new Digital Europe Programme (9.2 billion euros) will concentrate on the digital transformation of SMEs – it will aim at creating Digital Innovation Hubs in all the European regions in order to ease the digital transformation of small businesses. In addition, the EC will aim at simplifying administrative burdens, and making the application and reporting procedures easier for all the beneficiaries, including the SMEs. For instance, simplified cost options (flat rates, lump sums and unit costs) will be increasingly used for the InvestEU financing. In addition, more coherent rules for application procedures among the different financial instruments will be applied based on the so-called single rulebook principle. Finally, the MFF purpose is also to reinforce the cohesion policy in Europe. The controversial debate is whether West and wealthy countries should benefit from the cohesion fund or not anymore. If the proposal is adopted, it will lead to more funds for the East countries. This should increase the capacity of such countries to dynamise the capabilities of their SMEs. The proposal reflects the idea that the digital investment gap undermines growth and innovation in the EU. In other words, there is a gap between demand and available expertise in the digital market. One of the purposes of the MFF is to overcome this gap through different funding programs. It is therefore proposed to double the amounts currently invested in the digital economy which would amount to around 187 billion euros for the digital economy and European research and innovation. It would represent a huge potential of development for European SMEs if the funds were to be adequately used. Digital transformation of the public services and businesses becomes one of the overarching EU priorities, which will receive 9.2 billion euros under the Digital Europe Programme. The Programme will contribute to the upscaling of digital innovation hubs, with particular attention to the development of artificial intelligence. It will also fund cooperation activities in the use of supercomputing, development of advanced digital skills, high capacity digital networks, activities that increase resistance to the cyberattacks. Digital transformation will also be a heading for the so called Connecting Europe Facility which supports cross-boarder digital infrastructure (such as access to broadband connections and high-capacity digital networks). The great importance of digital investment is stressed by the EC as it also leads to strengthen European competitiveness and economic growth. Digital investment is announced to be the key priority for all areas under the InvestEU programme, the new investment instrument which will grant loans, equity or other market-based instruments for strategic investments in Europe. Moreover, the EU intends to promote innovation and research excellence by attributing the record budget (97.9 billion euros) for the EU-wide research programme Horizon Europe. Further support to innovative companies with high potential technologies will be provided by the new European Innovation Council. Finally, digital priorities also play a significant role in other areas. For example, European Social Fund and Erasmus+ will further invest into development of the digital skills, European Regional Development Fund and Cohesion Fund will promote digitization and connectivity in all the European regions, including the rural areas. The next step in the EU budget talks will follow within the weeks. By mid-June 2018, the European Commission is expected to reveal detailed sector-specific programs, including one dedicated to the research, innovation and digital sector. Afterwards, negotiations will move to the European Council, which adopts the Multiannual Financial Framework unanimously. The European Parliament, voting with absolute majority, can either approve or reject the Council’s position, but is not allowed to amend it. In all, the adoption of the MFF 2021-2027 is expected before the European Parliament elections in 2019.